Who put superglue on Dad's hat? Was it really a ghost that made Mom tear out the house? Matilda is a genius with idiot parents - and she's having a great time driving them crazy. But at school things are different. At school there's Miss Trunchbull, two hundred menacing pounds of kid-hating headmistress. 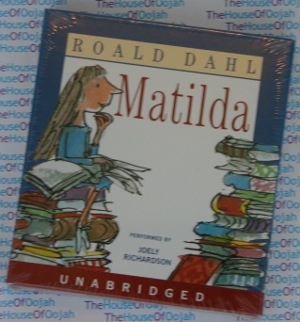 Get rid of the Trunchbull and Matilda would be a hero, But that would take a superhuman genius, wouldn't it? Roald Dahl (13 September 1916 – 23 November 1990) was a British novelist, short story writer and screenwriter, born in Wales of Norwegian parents, who rose to prominence in the 1940s with works for both children and adults, and became one of the world's bestselling authors. His most popular books include The Twits, Charlie and the Chocolate Factory, James and the Giant Peach, Matilda, The Witches and The BFG. Dahl's children's works are usually told from the point of view of a child. They typically involve adult villainesses who hate and mistreat children, and feature at least one "good" adult to counteract the villain(s). These stock characters are possibly a reference to the abuse that Dahl stated that he experienced in the boarding schools he attended. They usually contain a lot of black humour and grotesque scenarios, including gruesome violence. The Witches, George's Marvelous Medicine and Matilda are examples of this formula. The BFG follows it in a more analogous way with the good giant (the BFG or "Big Friendly Giant") representing the "good adult" archetype and the other giants being the "bad adults". This formula is also somewhat evident in Dahl's film script for Chitty Chitty Bang Bang. Class-conscious themes – ranging from the thinly veiled to the blatant – also surface in works such as Fantastic Mr. Fox and Danny, the Champion of the World. Dahl also features in his books characters that are very fat, usually children. Augustus Gloop, Bruce Bogtrotter, and Bruno Jenkins are a few of these characters, although an enormous woman named Aunt Sponge is featured in James and The Giant Peach. All of these characters (with the possible exception of Bruce Bogtrotter) are either villains or simply unpleasant gluttons. They are usually punished for this: Augustus Gloop drinks from Willy Wonka's chocolate river, disregarding the adults who tell him not to, and falls in, getting sucked up a pipe and nearly being turned into fudge. Bruce Bogtrotter steals cake from the evil headmistress, Miss Trunchbull, and is forced to eat a gigantic chocolate cake in front of the school. Bruno Jenkins is turned into a mouse by witches and, it is speculated, possibly disowned or even killed by his parents because of this. Aunt Sponge is flattened by a giant peach. Dahl's mother used to tell him and his sisters tales about trolls and other mythical Norwegian creatures and some of his children's books contain references or elements inspired by these stories, such as the giants in The BFG. Many of his children's books are illustrated by Quentin Blake. Roald Dahl died in November 1990 at the age of 74 of a rare blood disease, myelodysplastic anaemia (sometimes called "pre-leukemia"), at his home, Gipsy House in Great Missenden, Buckinghamshire, and was buried in the cemetery at the parish church of Saints Peter and Paul. According to his granddaughter, the family gave him a "sort of Viking funeral". He was buried with his snooker cues, some very good burgundy, chocolates, HB pencils and a power saw. In his honour, the Roald Dahl Children's Gallery was opened at Buckinghamshire County Museum in nearby Aylesbury. In 2002, one of Cardiff's modern landmarks, the historic Oval Basin plaza, was re-christened "Roald Dahl Plass". "Plass" means plaza in Norwegian, a nod to the acclaimed late writer's Norwegian roots. There have also been calls from the public for a permanent statue of him to be erected in the city. Dahl's charitable commitments in the fields of neurology, haematology and literacy have been continued by his widow since his death, through the Roald Dahl Foundation. In June 2005, the Roald Dahl Museum and Story Centre opened in Great Missenden to celebrate the work of Roald Dahl and advance his work in literacy. In 2008, the U.K. charity Booktrust and Children's Laureate Michael Rosen inaugurated The Roald Dahl Funny Prize, an annual award to authors of humorous children's fiction. Dahl married American actress Patricia Neal on 2 July 1953 at Trinity Church in New York City. Their marriage lasted for 30 years and they had five children: Olivia (who died of measles encephalitis, aged seven), Tessa, Theo, Ophelia, and Lucy. He dedicated The BFG to Olivia. When he was four months old, Theo Dahl was severely injured when his baby carriage was hit by a taxi in New York City. For a time, he suffered from hydrocephalus, and as a result, his father became involved in the development of what became known as the "Wade-Dahl-Till" (or WDT) valve, a device to alleviate the condition. In 1965, Neal suffered three burst cerebral aneurysms while pregnant with their fifth child, Lucy; Dahl took control of her rehabilitation and she eventually relearned to talk and walk. They were divorced in 1983 following a turbulent marriage, and he subsequently married Felicity ("Liccy") d'Abreu Crosland (born 12 December 1938), who was 22 years his junior. Ophelia Dahl is director and co-founder (with doctor Paul Farmer) of Partners in Health, a non-profit organization dedicated to providing health care to some of the most impoverished communities in the world. Lucy Dahl is a screenwriter in Los Angeles. Tessa's daughter Sophie Dahl (who was the inspiration for Sophie, the main character in her grandfather's book The BFG) is a model and author who remembers Roald Dahl as "a very difficult man – very strong, very dominant ... not unlike the father of the Mitford sisters sort of roaring round the house with these very loud opinions, banning certain types – foppish boys, you know – from coming round."